Question: During the seminar one friend said that when he was a child he played with toy cars and that the game was reality to him. What is preventing us today from revealing that everything we are doing isn’t a game but reality? Answer: If we truly played, we would have revealed the Creator already. The whole game is in the group. Up until today we hadn’t gotten together as needed. We were doing the preparation work, and time didn’t go to waste. We were waiting for the general state and atmosphere in the world as well as our own inner readiness. Gradually we’ve come to the point where we’re ready to realize this readiness in the group. Such groups will multiply throughout the world. What Is Our Life? A Game! Question: All my life I have been looking for connection with the Creator. And now I am feeling it; I understand that the Creator sends me serious disturbances. There is an internal dialog with the Creator. I need to understand what He wants from me. How can I understand this, how can I feel Him? Answer: Everything related to the revelation of the single upper force, the Creator, also applies to women. Only women lack the ability to create a detector, a sensor, a sense of perception of the Creator. Men cannot create this detector if they do not have women’s support. We work together. Women have to create an environment around men: to push, persuade, help, support in everything they can, but the main thing is their desire. Your desire should influence the men. Like a wife who sends her husband out of the house, let him work and bring home income because the family has to survive. Without this, men would be playing with their “toys” all their life. It is because of women’s desire that the world develops in our world and in the spiritual world. The woman is better suited for dissemination. If she is engaged in dissemination, this is her function: She gives birth, she expands. In doing so, she works much better than men. I believe that this realization is the most true and correct. In addition, she must support the men’s group, take care of it as a mother does her children so that they do not argue and fight, to settle and soothe them. The women also should agree. If there is a good, correct agreement between them, the men inside will not be able to argue. Try it. Men always feel a little bit of a mother in the woman; it remains with them for life. If you create such an even, good atmosphere, the men will feel that in this environment they have to behave differently. If you begin to further their unity, your desire will suddenly start working towards their connection, that is, their spiritual advancement. Can you imagine, what work you are doing, and what you cause! My Comment: Everything is correct, except that there are no means of integration in our world because to do this we need to replace egoism with bestowal, hatred with love, and this is possible only through the method of integral education. Does Europe Have A Death Wish? There is nothing but the relationships among us, relationships of receiving and bestowal. The result of these relationships should be to bring contentment to the Creator. 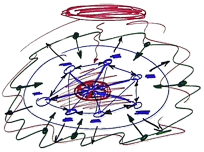 The upper Partzufim cooperate: Abba and Ima, and ZON perform endless different actions, the Reshimot (reminiscences) change, but the main thing is the intention of the person who operates this whole system. Before he operates it everything in it is dead, still. Then a person comes and the first thing he does is to weed out the dry thorns from the vineyard, which means that he cuts and separates the “stony heart” that cannot be corrected. Then he begins to work with all the rest. Prior to that, the whole system is quiet and a person operates it according to his exertion: He “presses the gas pedal,” he wants the system to work in order to bestow. There is a set table in front of me and I have to gradually take everything that is on it and enjoy the refreshments in order to bring contentment to the host. So I check my vessels and see that they are vessels of receiving. I mustn’t receive even one gram of pleasure in them. First I must restrict myself. If the host is important to me, I will not enjoy for my sake, but will only want to enjoy for his sake. But how can I bestow upon him, where can I find the power to do so? I begin to look for different methods and advice, and eventually reach the request. In order to receive such power, the Creator has to be revealed to me as the One who bestows, and then He reveals His greatness and His importance to me. But when the power of bestowal reaches a person, it doesn’t rule him, but according to a person’s request, it only rules his desires to receive. I am made totally of this desire to receive, so how real can my request for the power of bestowal to rule me be? I can scream forever, but it will just be empty tears because I don’t know what to ask for. It’s like a baby who cries loudly, but no one gives him what he wants. We are angry that we don’t receive the spiritual revelation, just like babies. I have to know exactly what to ask for. If I know what to ask for, how to ask, and for what reason, then my request will be effective. How can I demand the attribute of bestowal? First I have to acquire its importance. This means that I am asking for the Creator and His revelation. I am not asking to enjoy Him, but only to attain the greatness of bestowal: “Let me respect you!” This is the final request. It isn’t so that I’ll feel good and receive pleasure. I only want to respect Him without taking myself into account. We can receive and demand this necessity from the environment. This request should not be expressed in words, in a fiery speech, or a carefully composed telegram. It’s revealed in the heart, it breaks the walls of the heart and spills out. I ask not in order to enjoy the feeling that I bestow, that I am great and equal to the Creator. I want to acquire the attribute of bestowal itself and I check my intention to improve my attitude to the friends. Then I will understand what Kabbalists write about and I will consciously be included in what is happening in Malchut of Atzilut. All these things take place in a clear and clarified manner inside me according to the process that Kabbalists describe and reveal it in small portions one after the other. We are very close to that. Question: I feel that I’m able to hold on to the thought that everything comes from the Creator. What I can’t understand is how to accept with love the disturbances that cause me pain? I can understand that they’re good for me with my mind. But how can I add love to this? Where is this love? Answer: You’re not completing the action, which is why you don’t feel love. You understand that the disturbances probably come from the Creator, and that, evidently, this is good. You know that you can’t escape the disturbance, so you accept it. You don’t finish it off with love. You don’t process this disturbance together with the group and invert it, thereby perceiving the disturbance as an expression of love. It’s like when parents punish a child, he needs to understand that they’re doing it out of love for him. They’re not punishing him, but his ego. What’s more, they want to raise the child above his ego. When he divides himself in two, “this is my ego and this is me,” and realizes that disturbances arise in opposition to the ego, then his “I” draws closer to the Creator and feels love. Comment: When I was a child I had no idea that someone was relating to me with love. All I saw was punishment. Answer: Then get smarter! You need to grow up, after all! You need to reach a state when you perceive the greatest problems and hardships as tremendous kindness and love. I’m being very serious. Everything depends only on your perception! We exist in a field of infinitely good Light. Nothing exists in the whole world but this. Only infinite love and infinite goodness! But our perception is flawed, and as a result we feel the opposite sensation. If you reconstruct yourself and grow your understanding, instead of hatred you will feel love, instead of evil, goodness, and instead of suffering, delight.